I like living in Lowell. I really do. But I'm accustomed to living here now and I rarely look around. The buildings are less... exotic. I mean, they're not strange or different anymore, or otherwise worthy of notice. Each building, each street, each canal is now just an unnoticed landmark on my way to and from work or the grocery store or the train station. What a shame. I suffer from a disease known as localitis. This disease is not terminal. If the person who has contracted the disease can not cure himself simply by concentrating more, then external remedies are required. Specifically, entertaining a visitor often does the trick. My cousin David stopped by today. Hooray. So I showed him around a little, walked up and down the canals, went to the museums. 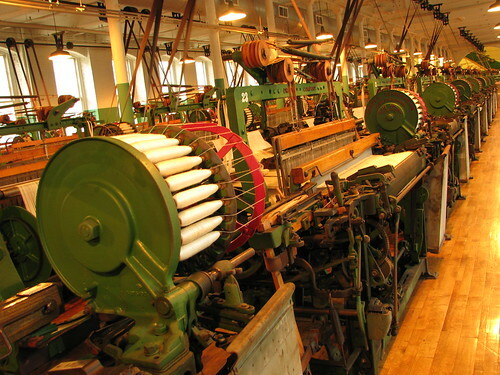 Most of the remaining textile mills are in good shape. The rest had already burned down, fell down, or were knocked down years ago. There are a few along the Hamilton Canal that look like scenes from a post-apocalyptic movie. I live at Boott Mills, which is the center of Lowell National Historical Park. (Hooray for the National Park Service.) That is, I basically live in a museum. I look out my window, boom, there's a museum. But I had never visited the museum itself. Without standing up from the couch, I can see the museum out of my window. Is that laziness? Not exactly. I like having something nearby that I haven't explored yet -- something to look forward to. I visited the museum today. 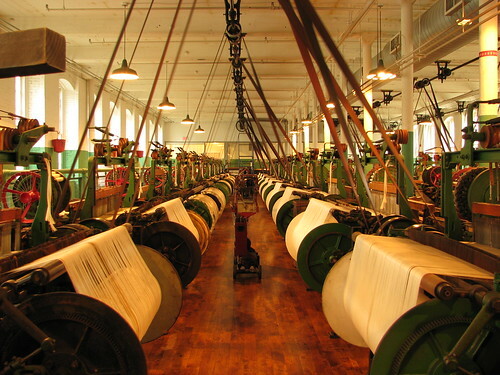 Inside the Boott Cotton Mills museum they have one floor of working looms. It's an interesting touch -- not just static machines on display behind a sheet of glass, but the real machines still being driven by water power, still spinning cotton thread into textiles. Below are a few pictures and a video of the action on the first floor. 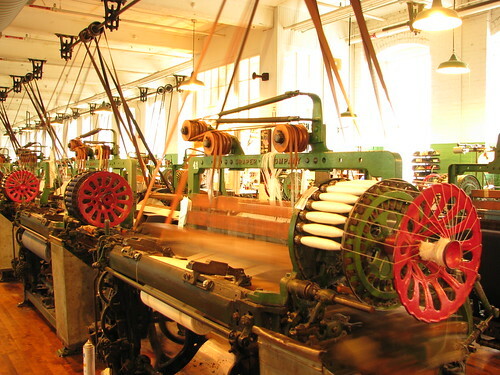 Loom at Boott Cotton Mills from Kirk Kittell on Vimeo. This entry was posted in Travel and tagged Lowell, Massachusetts, photography on 2010-06-06 by kirk.kittell.